When I first saw that Sam from Becks and Posh and Monkey Gland from Jam Faced was hosting “What’s for Pud?”, I was intrigued. Their directions were clear and simple, make an English dessert: “English not British. No Irish, Scottish or Welsh delicacies today, thank you.” I’ve sampled a few English desserts, partly because I did my Master’s degree in London a few years back. During that time, I did what any student would do: workout, eat, text message friends, shop, drink at cafes, eat, go clubbing, sleep and try to study before class. With this post, I was flooded with fantastic memories of shopping in the food sections at Sainsbury’s, Marks and Spencer, Fortnum and Mason, Harrods, Blue Bird, and all the wonderful markets in London. I fortunately had a chance to eat and sample some really amazing food and dessert there. I believe that this dessert is popular for a number of reasons. It’s simple (traditionally using left-overs). It contains delicious ingredients like whipped cream, pastry cream, macerated fruit, and alcohol-soaked cake (the English like their alcohol). Finally, all of this is combined to make a muddle of tasty goodness. After flipping through many of my cooking and pastry books, I chose two or three recipes that jumped out at me. I then amalgamated recipes to create a contemporary English trifle. The version that I made uses Nigella Lawson’s Madeira cake, Grand Marnier, raspberries, strawberries, my favourite pastry cream from Michel Bras, whipped cream and finally is topped with chocolate and pistachios. 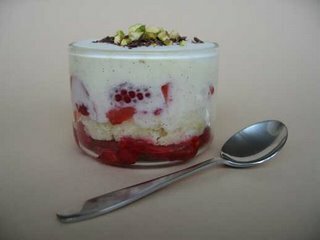 If you are bringing this to a party or event, trifle looks magical in a glass bowl. However, if you are serving this at a dinner party, I suggest using small glasses or cups as it will look beautiful and be easy to serve. 1. Cream butter and sugar together and add lemon zest. 2. Add one egg at a time and mix until combined. 3. Add flour and mix, then add lemon juice until just combined. 4. Pour mixture into the prepared cake pan and bake in the oven for approximately 1 hour or until a cake tester comes out clean. 1. In a small pot add milk and the vanilla bean seeds and pod. Bring to a boil and remove from heat. Let the vanilla infuse in the milk for five minutes. 2. In a small bowl mix the egg, egg yolk and sugar together. Mix until it turns pale. Then whisk in the cornstarch and mix thoroughly. 3. Temper the egg mixture with a small amount of the milk mixture. 4. Once tempered, add the rest of the egg mixture to the milk mixture. 5. Put the mixture back onto the stove and bring the mixture to a boil stirring constantly with the whisk. When the mixture comes to a boil, lower heat and cook until the mixture coats the back of a wooden spoon. 6. Once the mixture is done, pass it through a fine sieve into a shallow container. Immediately cover the pastry with plastic wrap directly over the pastry cream. This is done to prevent a skin from forming on the top of the pastry cream. 7. Refrigerate until completely cool. chopped or sliced nuts: almonds, pistachios, etc. 1. Cut Madeira cake into slices or cubes and place in small bowls or a large glass bowl. 2. Drench the Madeira cake with 1/4 – 1/2 cup of your chosen liquor. 3. Mash some of the raspberries and strawberries and mix with whole berries, spoon overtop of the drenched Madeira cake. 4. Mix pastry cream and pour over top of the berry compote. 5. Whip some cream and dollop or pipe over top of the pastry cream. 6. Let the flavours of the liquor, berries, pastry cream and cream soak into the cake and each other. Let the trifle rest in the refrigerator overnight or for 4-6 hours. 7. Top with nuts, chocolate or other condiments. 8. Spoon the trifle out and eat! Technorati Tags: English Trifle, Whats For Pud? Posted by Sam at 10:18 p.m.
From one Sam to another. Sam - you are my first entry. I was worried that only the girls were going to take part, so I am happy to to see you and your scrumptious looking trifle. It's no trifle - making a trifle - is it? And it looks like you did a more than stellar job of it. Merci! That looks beautiful, especially with the pistachios on top (did I mention I love pistachios?). I've never made a trifle as I've always considered a bit over the top but you've shown me the error of my ways. Such a nice entry. I always wanted to making a trifle and never did. This looks delicious! Sam, that looks extraordinary. I especially loved that you cherry picked the best recipes to come up with something of your own. Brilliant and delicious. I love your name and I love your blog. Thanks for your lovely comments and thanks for hosting this fun event. Happy St. George Day ! Trifle is great. I love how one can easily tailor it to their own tastes. I think that it is a simple and very versatile dessert to make. It is definitely English comfort dessert. I recommend making trifle when you get a chance. It is one of those homey dessert that you can just keep eating and eating. Thanks for your comment. It was fun choosing what recipes would constitute the building blocks for this dessert. I make a trifle nearly every year for a holiday dessert-a job I inherited from my English mother. One of the things I like about it is that you can vary it, within certain strictures-each time. Yours is lovely, and meets all of my family criteria- the most important of which is "no bloody jello, please." Some infidels put jello layers in their trifle, if you can believe it! From experience I would just note that the giant glass trifle bowl-when full of trifle-is ungodly heavy to transport. It looks great though, so I do it anyway. Your trifle looks lovely! I'm not a big fan of trifle but your looks very tempting with the fresh fruit en pistachios! Love the idea of the individual servings ... just when my father will * finally * I'm told pass along my mother's trifle bowl. Wonderful, Sam! This looks so delicious and so perfectly English, that I think even the Queen would approve! I've only made trifle once, and even then it wasn't a traditional trifle with proper English ingredients, but used lemon curd and blueberries (http://candiedquince.ca/archives/42). Perhaps I should try your version on Victoria Day ...? I'm glad that my trifle meets your family's criteria. Thanks for the note about: "the giant glass trifle bowl-when full of trifle-is ungodly heavy to transport." Too much goodness is often heavy. If you make trifle from scratch and tailor it to your own tastes... it is heavenly. Individual servings work well, they keep the dessert looking clean, fresh and simple. I think I could go either way with the jello issue. I like the idea of jello adding colour, texture and contrast. But in regards to a traditional English trifle, I'm not sure I would add it. Thanks. Thanks for your comment. I laughed about the Queen comment, because I actually had the oppurtunity to meet the Queen when I was studying in London. I have pictures of me shaking her hand and addressing her as your Majesty... I kid you not! Anyways, I think the reason why this trifle is tasty is the double cream factor: pastry cream + whipped cream. The English definitely like their cream. I've tagged you for the recipe collection meme. No pressures, no worries. Yum! Fruit and cream and pistachios and liquor! What could be better! Thanks for your sweet comment and the tag. I hope that you and your foot are doing better. Thanks for visiting. Your blog looks great! Lovely looking trifle - I like the Michel Bras dessert book too, though some of the recipes seem to have... issues. Thanks for visiting. I really enjoyed your post on sussex pond!